After Apple’s iOS 11.2 update with faster wireless charge, a wave of complaints are pouring out onto the online community as most wireless chargers are not charging at a speed of 50% faster even though limitations have been increased from 5.0W to 7.5W. Ringke’s expert team of technicians has decided to conduct an experiment to verify the claims which led to an unexpected discovery. The secret of supporting faster 7.5W wireless charging for the iPhone X has been uncovered. On December 2nd, Ringke began testing wireless charging speed after Apple’s iOS latest update and faced a slow charging result below the claimed 7.5W standard. The results revealed that the electric current was 6.4~6.9W instead of the faster 7.5W charging. Although it was not a problem for normal daily use, the technicians doubted the possibility of software and hardware problems, and started to do serious case study analysis. The engineers first checked for hardware defects. In addition to examining the structure of the iPhone X, the technician started to measure the wireless charging voltage from a Galaxy Note 8 on the wireless charger. After several tests and disassembly, the wireless charger itself was not found to be faulty. So, now onto checking possible concurrent software problems. Software issue has been more difficult than hardware problem to identify if any issues were present. The wireless charging test was conducted dozens of times with the suspicion based on the idea that ‘Apple only controls the charge current by assigning an ID to a particular wireless charger’. However, other companies’ wireless chargers, including those certified by Apple, were also experiencing similar issues as the Ringke wireless charger. They were charging at a speed of 5.8W to 7.1W, which is lower than 7.5W. The engineer who encountered these lower speeds found another possibility for the lower performance. After a trail of successful tests, the result displayed that the watt changes immediately following different charging positions. Experiment 3 – The Answer is Position! The position of the wireless charger indicates a significant change in electric current. Of course the current would change by position of the device on the wireless charging pad, but strangely it was found that it is possible to charge at 7.5W only by placing the charging pad coil slightly lower than the center by a mere 1 cm to notice a difference. 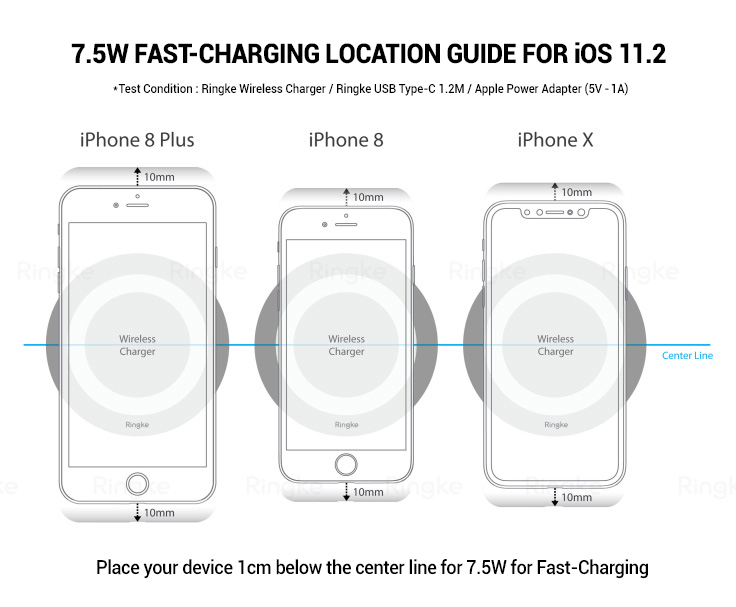 Finally, Ringke measured the varying positions and speed by only alternating the position of the wireless charging coil and the iPhone X under the same conditions, and the findings were able to confirm the iPhone 8 Plus is correctly charged with the released 7.5W ~ 7.8W current. It’s important to note though that the iPhone X as well as the iPhone 8 showed similar results which led us to find that many wireless charging devices can possibly access maximum charging speed simply by adjusting the position of the device on the charging pad. If you want to charge your iPhone X, iPhone 8, and iPhone 8 Plus with the faster 7.5W wireless charging speed, simply remember to position the device only 1cm lower!